FRIDAY, Oct. 21, 2016 (HealthDay News) -- Helmets and other required safety gear do little to ward off serious injury among young motocross racers who crash on the off-road courses, a small study warns. 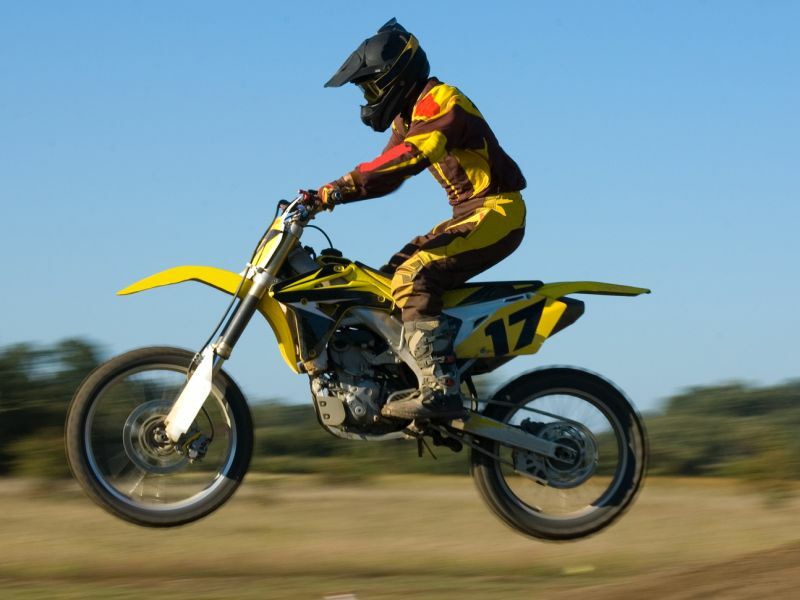 Investigators tracked 35 boys ages 8 to 17 who competed in rough-terrain motorcycle racing events known as motocross. Over 10 years, more than 85 percent were injured while competing or practicing, and nearly half suffered concussions. One boy died from his injuries. "Despite the use of required safety equipment and track regulations, pediatric motocross athletes suffered serious, sometimes life-threatening injuries," said study lead author Dr. Christopher Arena. He's a resident with the Department of Orthopaedics and Rehabilitation at Penn State Health, Hershey Medical Center. Besides concussions, these injuries included bone fractures and dislocations. The steep hills, jumps and sharp turns typically found on motocross courses are challenging. More than half the boys' injuries were related to a jump obstacle, the study authors said. Arena said the findings can help pinpoint needed safety measures. But a Florida pediatric specialist thinks the findings are alarming enough that the high-impact sport should be limited to adults. "At some stage, we may just have to say that kids under 18 shouldn't do motocross," said Dr. Barbara Pena, research director in the emergency department at Nicklaus Children's Hospital in Miami. "It may just be that safety equipment simply isn't enough when you're talking about a young boy's head being constantly battered. If it was my child I probably wouldn't allow it," said Pena. Arena described motocross participants as "true athletes," with a training paradigm on par with that of any Division I college or professional athlete. "I think the sport is absolutely growing in popularity," he added, noting corporate sponsorships and television exposure that brings the activity into the mainstream of American athletics. But there is relatively little information on the injury profile of motocross athletes, said Arena, a former motocross racer himself. He and his team wanted to fill that void. For the study, they sifted through injury data from pediatric trauma centers involving under-18 competitors who had a motocross accident between 2004 and 2014. They focused on 35 boys who raced on motocross tracks sanctioned by the American Motorcycle Association. All routinely wore mandated safety equipment: helmets, shatterproof goggles, protective boots and pants, and long-sleeve jerseys, the researchers said. Over the decade, 30 riders were injured during competition, while five were hurt during practice runs. Injury risk appeared to be highest during May and August. Despite helmet use, 49 percent of the injured riders experienced a concussion. Nearly three-quarters suffered some orthopedic injury. Among 32 fractures, broken legs were most common, but broken arms, ankles and collarbones were reported, too. Lower extremity fracture risk was found to be twice as high as upper extremity risk, and surgery was performed in more than 80 percent of the lower fracture cases, the study revealed. Pena said the study highlights the same problem now driving football-safety concerns: concussions. "A child's brain is still developing," she said, "and we don't really know how much injury a developing brain can take before it causes long-term damage." She emphasized that many of these young motocross athletes suffer concussions even if they're wearing a helmet. "That's huge," Pena said. "Because if you want to protect the head what else is there other than a helmet? How much more protection can you get?" Arena, however, said he believes "the sport can be made safer," through helmet design improvements and rule changes that place a premium on reducing head injury risk. The findings are scheduled for presentation Sunday at the annual meeting of the American Academy of Pediatrics, in San Francisco. Until the findings are published in a peer-reviewed medical journal, they should be considered preliminary.